The Hoi An ancient Town welcome tourists from all over the world by the features of not only landscape with nostalgic but attractive colors, friendly people, excellent cuisine but also its public transportation especially there are several pedestrian lanes. The old town’s attraction over the years hasn’t still changed. The most special feature is that to make sure safe trips for tourists, all motorized vehicles are just allowed to run in this place for some hours daily. 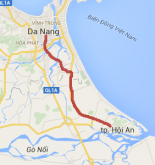 In this article, I will help you get a perfect trip by information of how to getting around Hoi An – a beautiful and ancient city. 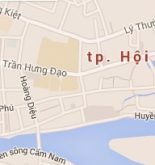 This is a very convenient means for tourists when visiting the Hoi An Old Quarter and nearby attractions in the vicinity. 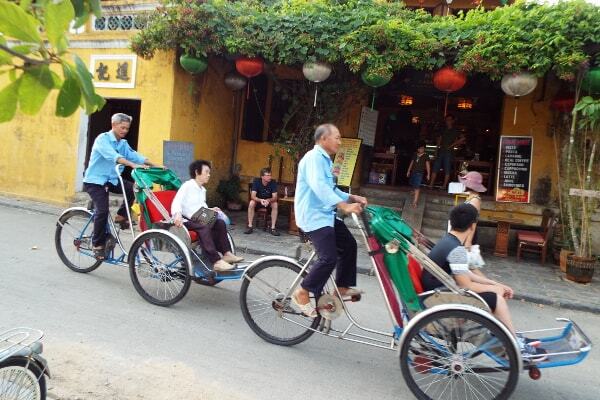 In the event of demand, tourists should directly contact with owners of cyclos on the streets at Hoi An regularly. On foot is the most popular form of transport when visiting and exploring the Hoi An Old Quarter. You had better use map to travel more convenient. The most propitious ways for pedestrians are the inside routes such as Bach Dang, Nguyen Thai Hoc, Tran Hung Dao. As I said easier, everyday, Hoi An celebrates the walking street for tourists so all motorized vehicles are prohibited. The Nguyen Phuc Chu Street located on the other side of the Old Quarter – the new walking street of Hoi An has the statue garden area, many restaurants, and crowded cafes. Also, there are souvenir shops alternately. Price for a rental motor-scooter: 200.000VND/ day. Most of motorbike taxis focus on forks, crossroads. This kind of means suits to your not short distance or when you are in a hurry. With some tourist attractions such as discovering Hoi An by boat or travelling Cham Islands (Cu Lao Cham), moving by boat or ship is a must. Tourist come to the Cua Dai Port then buy boat ticket to travel Cham Islands. Or at area of the Cau pagoda, there are small wooden boats carrying tourists along the Thu Bon River. In terms of cost, you and boat owners will have a suitable agreement.